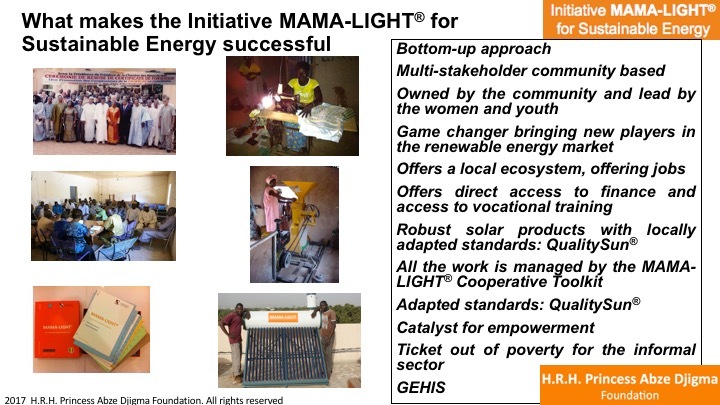 The MAMA-LIGHT® Initiative for Sustainable Energy is a worldwide program that provides access to affordable and sustainable energy for women, small business and children. It empowers the informal sector, it drives the generation of new jobs and it creates a sound basis for gender equality and women empowerment. The program is selected by the United Nations at the Solutions Summit at UN General Assembly in 2015 as one of the 14 breakthrough solutions for achieving the Sustainable Development Goals see also the report about the UN Sustainable Development Summit. The Secretary General of the United Nation, H.E. Ban Ki-moon, recognises the work H.R.H. Princess Abze Djigma is doing with The MAMA-LIGHT® Initiative for Sustainable Energy, see his gratitude letter.